Behmi is a fruit growing wild in the dry temperate region of the Western Himalayas which is adjacent to Tibet, between 2500 to 3000 meters above the mean sea level. Tree drooping, domed topped, height 9.60 m, spread 9.80 m, trunk girth 87.33 cm, bark colour grayish brown. Leaf shape lanceolate, apex aristate, base round, margin finely serrate, pose upheld to intermediate, lamina flat, colour yellowish green (merging leaf) and grayish green (mature leaf), upper surface glabrous, lower surface pubescent along mid-rib, length 10.45 cm’ breadth 2.25 cm; petiole yellowish green with red upper side, length 2.22 cm; glands orbicular and reniform, yellowish-d to brown, 7.0 in number. Flowers white with a tinge of pink at base, 3.47 cm wide; petals 1.69 cm long, 1.32 cm broad; stamens 34.9, 1.19 cm long; style twisted, 1.11 cm long. Fruits round, apex pointed, base round, greenish yellow, fuzz on surface coarse, 3.32 cm long, 3.14 cm broad, weighing 21.03 g each. TSS 10.94%, acidity 2.03%, total sugars 4.83%, reducing sugars 2.02%, non-reducing sugars 2.67%. Stone oval, smooth, clinging, 2.06 cm long, 1.38 cm broad; kernel oval, 1.63 cm long, 078 cm broad and bitter in most cases. However, in some trees the kernel taste sweet and is eaten. Flowering takes place between 20 March and 15 April. The fruits ripen between 15 September and 10 October. Behmi fruits, though a bit sour, are eaten. These are also sun dried and used later for making a hard alcoholic liquor that is quite popular with local tribesmen. 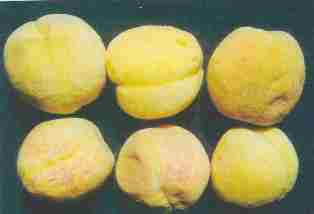 Sweet kernels are eaten and added in sweet dishes as a substitute for almond. Oil is also extracted from kernels. This oil is used cooking as well as hair oil. A message with behmi oil is recommended for patients suffering from disorders of joints. There is always a demand for behmi oil in the market due to this. The wood I used as a timber and for making agricultural implements. 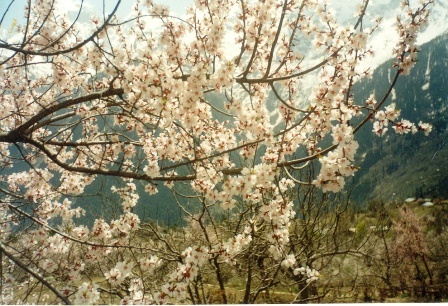 Behmi seedlings are used as a rootstock for peach and almonds. 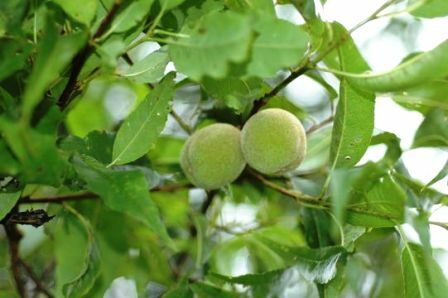 Many taxonomists, including Jagdish Kumar Sharma, who carried out a detailed study on the taxonomy of this wild growing fruits, believe that behmi is a natural hybrid between peach and almond.